Do Bandai Namco think we’re a bunch of mugs or what? Just what does tea have to do with Dark Souls 3? I’ve been trying to come up with a pun to make about this strange partnership with Yorkshire Tea, and the best I can do is this: brew died. Have a cup of tea and chill out with our list of PC’s best RPGs. It might seem completely random – and it is a bit – but it’s all for a good cause. 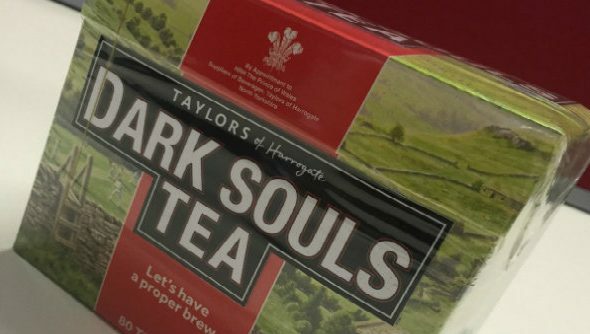 This one-off, 80 bag box of Dark Souls 3-branded Yorkshire Tea will be auctioned off to raise money for SpecialEffect. SpecialEffect is a charity that uses technology and videogames to improve the quality of life for disabled people. Check out the SpecialEffect site to see some of the brilliant work they do. The highest bidder over £100 will receive this special box of tea and all money will be donated to SpecialEffect as part of the Monster Race fundraiser. You can find the full details and place a bid via the charity page. At the time of writing, it’s at six bids and is sitting at £230. Check out our Dark Souls 3 review in progressahead of the game’s April 12 launch.